Can you efficiently track an order within the shop and from vendor to vendor all the way to the job site? You can now, with P2 PROGRAMS’ STEEL TRACKING SYSTEM! 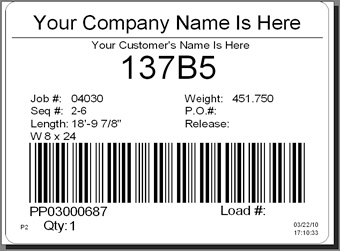 Isn’t it time for your company to update their tracking system with the latest technology of barcoding? Give your employee the power to increase productivity and accurately capture information with the ease of today’s barcode technology. 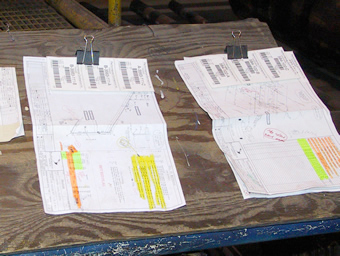 The Steel Tracking System accomplishes this by expediting the process of tracking your product through the reduction of manual paper work. Your employee’s work load will be lightened and you will have the benefit of an increase in production while maintaining a high degree of accuracy. With our interface into other software products (FabSuite, FabTrol and Romac) in the Steel Industry, all the data collected on the Mobile Computers will automatically be transmitted to these other software products so you can have “real-time” information in those systems as well! 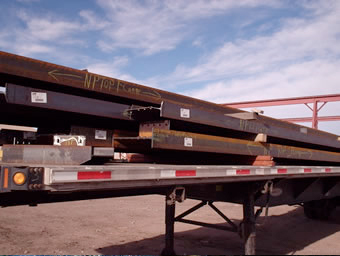 The Steel Tracking System gives you the ability to uniquely identify each piece of steel with a barcode serial number. P2 Programs’ high quality barcode labels are printed with ease, are capable of being scanned from 2 feet away by a laser scanner, even in bright sunlight, and are sturdy enough to withstand the harsh environment of the steel industry. Users of the Steel Tracking System agree, a significant benefit to the barcode labeling of steel is the highly visible piece mark information that it contains. There are several ways to get the piece mark information into the STS package. One way is to use the Piece Mark entry window and hand key the data directly into the system. There are several more screens (Job Info, Load Info, Pc Mark Info, ID Info) associated with this entry window. This is the slowest way to enter data into the STS system but allows for much more information to be captured and stored in the system. The preferred method of entering the piece mark information is by importing the data from another software package. There are options to import data from E.J.E.’s Structural Material Manager, AutoCad, Design Data, SteelCad, a generic delimited file and several custom file formats. Whether you are hand entering the data or importing it from another software package, each piece of steel is given a unique ten digit barcode identification (ID) number. From this point on, all activity on a given piece of steel will use the ID number, not the piece mark, as a reference point back to the information in the STS package. 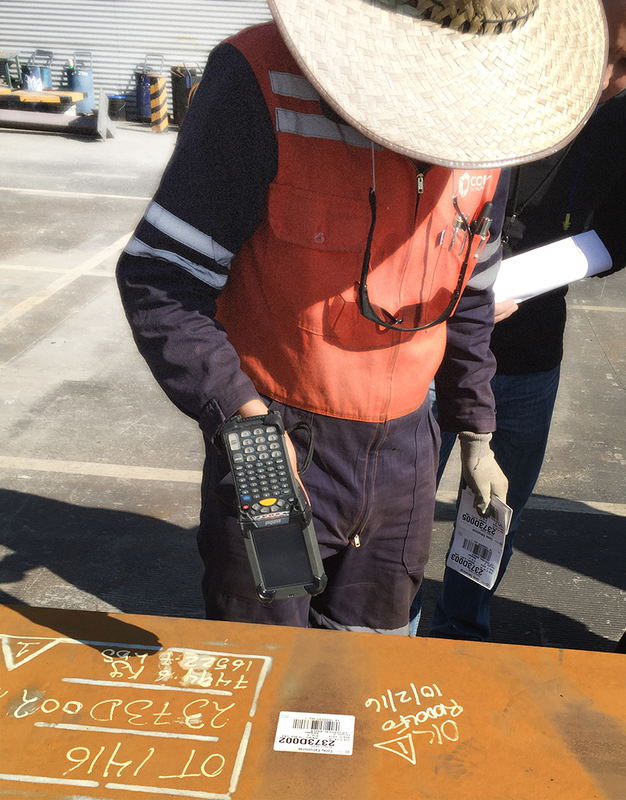 Once the piece mark information is in the system, you can print barcode labels to be applied to the steel. 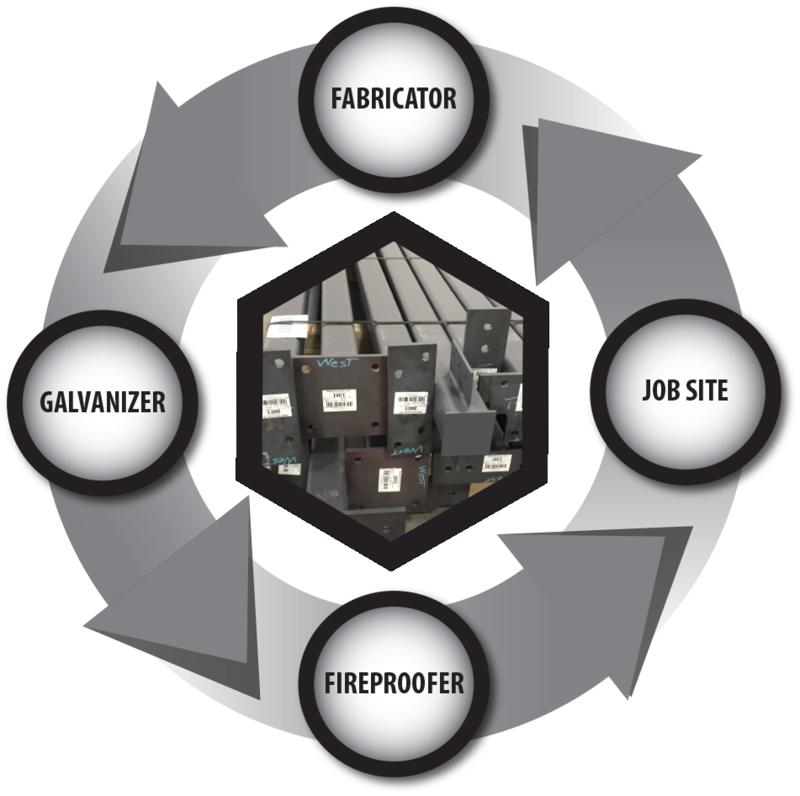 Most fabricators apply the barcode after Final Inspection so that the barcode will not be destroyed during the fabrication process. It also provides an excellent visual indication that the piece has passed inspection. When shipping the steel using either the batch or Radio Frequency (RF) portable, you will enter the customer and job number that you are shipping. Next, the system will prompt you to enter the load number and other information about the trailer on the RF portable. As you scan each barcode label, the system will verify that this piece has not been shipped before and it is for this customer and job. The portables will display the cumulative weight of each load as the barcodes are scanned. Pieces can be added or removed from a load on the portable device and when you have completed the loading process, if you are using the batch device, you must take the portable to the nearest PC to upload the information into the STS package and then print the packing list. If you are using the RF device, all the information is already in the STS package, all you have to do press the control-P (^P) key sequence on the RF portable and the packing list will be printed in the office. Now that all the trucks have been loaded, you can create an export file to be sent to the job site. This file contains all the information that will be necessary to receive the steel, the number of loads being shipped, the piece marks on each load and their associated barcode numbers, piece weight, length, description, etc. This information is typically sent through an e-mail or Internet account. The file can be created to send all the information on a job (master shipper) or only the pieces that have just been shipped. To receive the steel at the job site and print discrepancy reports, you must import the file that was created by the fabricator. This file will tell you what you should expect to be receiving. After this file is imported and you have scanned all the pieces of steel on the received load(s), you can print a discrepancy report to show which items the fabricator said you should have received versus the ones you have scanned. Also during the receiving process, you can indicate the location and status of each piece. This has been used in the past as an inventory system at the job site and with the Move function on the portable, you can track the movement of the pieces in the lay-down yard or even the pieces that have been erected. After the receipt of the steel at the receiving operation, you can generate a file to be sent back to the fabricator to indicate which items have been received and on which load they were received. From the fabricator’s perspective, if agreed upon between the interested parties, this file could be used as an indication that this material can be invoiced thereby decreasing the amount of time it takes to be paid. With the built-in report writer, you can analyze the data within the system many different ways. Progress, Erection, Damaged Items and Receiving reports can be generated, customized and printed to printers or files for import into other software packages. The report writer is a wide open system that allows you to create custom reports on the data in the STS system.